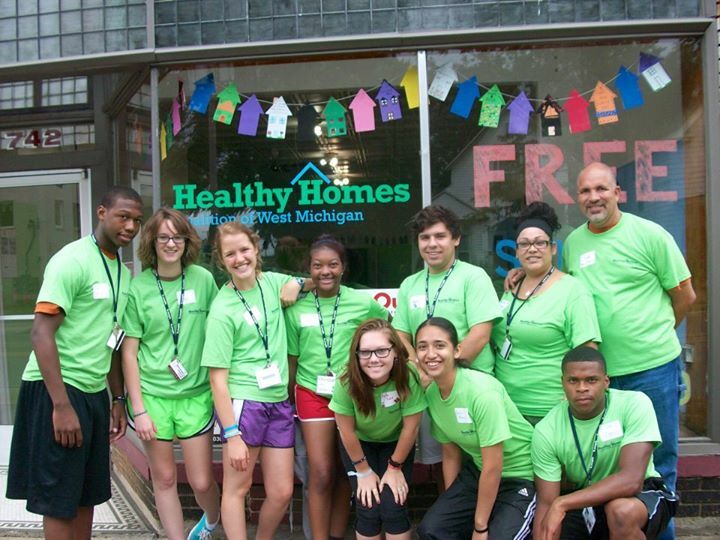 The Healthy Homes Coalition is grateful for the work of our volunteers as they help us fulfill our mission protect children's health and wellbeing by eliminating harmful housing conditions! Would you like to join the team? See the volunteer opportunities posted below, or fill out the form on the Volunteer Opportunities Page and we'll be in touch to see how your skills and passion can help our cause. We welcome requests from individuals, groups, and students requesting internships. Let's talk and then get to work protecting kids! The Healthy Homes Coalition relies upon dozens of volunteers each year to install smoke alarms, get the word out, and help families. Peer Educator Job Purpose: Volunteers needed to go into Grand Rapids homes to educate families about lead poisoning and other home hazards. Peer Educator Job Duties: Volunteers will be trained to conduct a quick visual assessment of homes to identify lead and other hazards. Educate residents about lead hazards and how to reduce them, the effects of lead poisoning, and available resources. Provide residents with all needed documents. Comfortable with going into peoples homes. Follow directions from Healthy Homes Staff. Positively represent the vision and mission of the Healthy Homes Coalition. Must have access to a vehicle or must be willing to work in a group with someone who does. Spanish speaking highly desired, but not required. If interested please submit our sign up form. Healthy Homes Ambassador Job Purpose: Ambassadors needed to aid in community awareness of and involvement in the work of the Healthy Homes Coalition by visiting community members through door-to-door contact. Connect with families, businesses, and organizations in the community to promote the work of the Healthy Homes Coalition (ambassadors may be the first point of contact with Healthy Homes). Work with Healthy Homes staff to create a Healthy Homes informational packet that can effectively engage a variety of community members. May assist with other social marketing efforts. Must be willing to follow directions from Healthy Homes staff. Comfortable going to people's homes. Must have access to a vehicle or be willing to work in a group with someone who does. Translator Job Purpose: Update Get the Lead Out! website Spanish translation. Translator Job Duties: Work within website editor to translate web pages from English to Spanish. Proficiency in both Spanish and English (especially written), Typing, Documentation Skills, Written Communication, Dependability, Attention to Detail, Administrative Writing Skill. Alarm Installation Job Purpose: Volunteers needed to go into families' homes and install smoke detectors and carbon monoxide alarms. Volunteers will also share important fire and carbon monoxide safety information with residents. Alarm Installation Job Duties: The primary job duties consist of, but are not limited to, installing carbon monoxide and smoke alarms. Providing residents with all needed documents and information in regards to the alarms, and gathering information and filling out all needed forms. Comfortable with, or willingness to learn how to use a drill. Now that we've moved into our new space at 1545 Buchanan Ave SW we could use a few helping hands around the office. We have a list of odd jobs including paint touch up, maintaining light fixtures, and more. Capable with various hand tools. Able to keep appointments and see projects through to completion. Office Assistant Job Purpose: Maintains office operations by receiving and distributing communications; maintaining supplies and equipment; picking-up and delivering items; serving customers. Maintains supplies by checking stock to determine inventory levels; anticipating requirements; placing and expediting orders; verifying receipt; stocking items; delivering supplies to work stations; creating education packets. Maintains office operations and confidentiality standards by performing light clerical duties to process customer documentation. Office Experience - General, Scheduling, Telephone Skills, Typing, Documentation Skills, Meeting Planning, Verbal Communication, Written Communication, Dependability, Attention to Detail, Administrative Writing Skill. File Archiving Job Purpose: Volunteers needed to help archive closed out paper client files to reduce paper volume in the office. File Archiving Job Duties: The primary job duties consist of coming into the office during office hours to scan paper files using our scanner. Files need to be prepared for scanning. Please note that this position may be combined with the office assistant position. Event Planner Job Purpose: Event planner needed to help with planning of various events including assisting with leading happy hours and donor appreciation events. Event Planner Job Duties: The primary job duties consist of, but are not limited to assisting the Executive Director with planning various events. This includes securing facilities and underwriters, managing invite lists, proposing creative event ideas, and coordinating staff activities. Previous event management experience desired. This may include social and other personal events. Accountable to timelines and planned deliverables. Legal Help Job Purpose: A skilled and appropriately qualified individual is needed to aid in the review, creation, and management of various documents and coverages. Legal Assistant Job Duties: Work with Executive Director to reduce organizational liability. Review documents, policies and contracts, assist with document creation as needed, and make recommendations. Previous legal experience or supervision required; attention to detail; dependability; be a person of honesty and integrity. Volunteer Coordinator Job Purpose: Volunteer Coordinator needed to manage organizational need for volunteers. Work with Administrative Assistant to assess need for volunteers, coordinate volunteer schedules, and provide orientation for new volunteers. Invests in volunteers by communicating expectations, schedules, and new opportunities with volunteers. Scheduling, Telephone Skills, Typing, Documentation Skills, Meeting Planning, Verbal Communication, Written Communication, Dependability, Attention to Detail. Must have biweekly availablity (1-2 hours) for 3+ months. Fund Development Intern Job Purpose: The Fund Development Intern will assist with advance organizing for a 2016 donor luncheon that seeks to attract and engage 250 motivated givers. Advance organizing will include securing underwriting, recruiting and training table captains, and developing publicity for the event. This is an excellent learning opportunity for students interested in nonprofit management, international development, or other fields where grassroots funds must be raised on an annual basis. Improve prospect list for underwriting at the table sponsorship level. Develop and distribute table sponsor packets, making follow-up phone calls to secure sponsorships. Support leadership with scheduling and approaching major event underwriters. Make contact with past table captains and new prospects to ensure a cadre of 30 table captains. Assist with organizing a table captain orientation and training. Support table captains. Maintain ongoing communication. ​Perform other tasks as assigned by the Executive Director. Strong profiencity in Microsoft Office. Strong interpersonal communication, writing, editing, research, and organizational skills. New and enhanced brochures, fliers, mailers, and other print collateral. Re-design of newsletter to make it consistent with recent website redesign. Assist with social marketing efforts. Possible events or media work. Tasks would be aligned with the interns skills and passions. The intern MUST be very dependable, able to work alone and unsupervised, and capable of being assigned broad tasks and being responsible for developing a work plan and managing tasks that lead to project completion.